Hi, I'm Rachel. I have loved all animals since I was a very small child. Birds of any kind have always been interesting to me because of their ability to fly, and their elusive nature. One of my favorite things to do, is to just sit out with the chickens, ducks and geese, and watch them go about their interactions with each other and I also love to just watch the way they move. Here at our place, called Sippo Park (due to my DH finding a sign with that name carved in it at his mother's lake house), we have many kinds of animals, as there is a place in my heart for all species. If there is "no room at the inn", we'll make one! Please enjoy my pages as much as we enjoy our sweet pets----as that is what they all are! 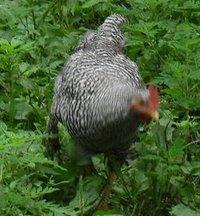 This is my original rooster, King Strut. He is about 1 1/2 years old here. 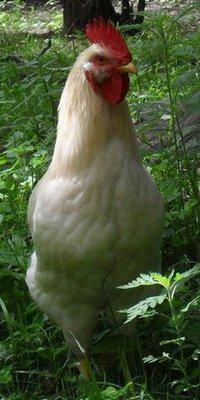 This is one of my younger roosters, Foghorn Leghorn, 5 months. Another of my 5-month old roosters, Stripe. And this is the last of our 4 roosters, Peter, my son's 5 month-old EE.